Cutting + sticking + sewing + baking. My creative life. Over the last decade or so, since the children were born, time spent with my Mum seems to have become hurried and harried. We grab rushed moments, make frantic childcare arrangements, we are both very busy. We decided to put some time aside and hang out together, yesterday we got together with our sewing machines and spent the day sewing and talking and it was lovely. I took some fleece offcuts which my friend Pam gave me along to my Mum’s house and made a really sweet little pram blanket. It’s so soft and snuggly. I’ll put it in my present stash for the next baby that comes along (my friends are always popping them out!). 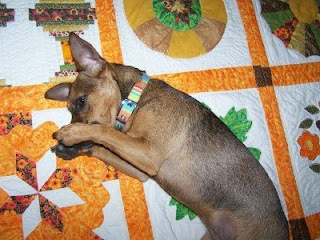 My dog, Billie Bluebell Buttercup, loves quilts and takes any opportunity to sit, lie, roll around on a quilt. My Mum was putting the sides on this lovely, bright, quilt-as-you-go sampler quilt and Billie could nor resist temptation! While I was at my parent’s house I took a photo of the quilt hanging above their bed. Unfortunately, you can’t see the beading which is one of my favourite parts. 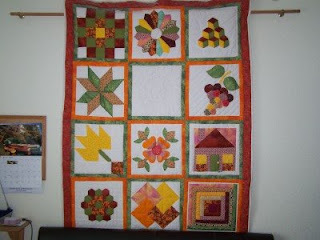 I think it was one of the first quilts my Mum made. Ever since I was a little girl and a sewing needle was put into my hand (there was no Health & Safety in the 1970s!) 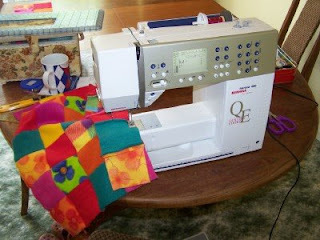 I have loved to sew. The common thread in my life IS the common thread! Oh, and I bake too.